75 Вт⋅ч литий-полимерн., 18 Wh Tablet, 57 Wh Base, Автономная работа (сведения производителя): 17 час. Powerhouse performance? According to Microsoft the new Surface Book 2 combines the best of two worlds and is also the most powerful Surface device yet. The specifications look promising, thanks to the new Kaby Lake-R processor and Nvidia's Pascal GPU. Our in-depth review reveals some shortcomings – some can easily be bypassed, but others are just incomprehensible in this price range. Microsoft's Surface Book 2 puts the power of discrete graphics into the best detachable 2-in-1 design you can buy, but it doesn't come cheap. Now with all this said it really comes down to is the price of the Surface Book 2 worth it? Sure, you can get a 13.5’ that is $1,149 but that only comes with a Core i5 and you can’t get your gaming on like you might want to. The model I been rocking is $2,900 and for that price you can get some tricked out gaming laptops with a ton more power. Surface Book 2 is gorgeous but it’s a costly decision to make. The Surface Book 2 is, by a long way, the most powerful and capable 2-in-1 laptop in the world right now, offering crazy levels of performance in all applications. Make no mistake, though, to enjoy its power you need to have a seriously large budget to play with. However, the one factor that prevents me from investing in this machine myself is that behemoth price tag. The Surface Book 2 in India starts at a price of Rs. 1,37,999 and for that price, you’re getting a powerful laptop in a portable size along with a detachable screen and great battery life, but is the form factor and build worth paying that extra money for, as a generic laptop with specs as the Surface Book 2 can be found for under half the price? For a student like me, probably not. But if you’re a professional and want to invest in a portable Windows machine specifically and don’t do a lot of processor/graphics-intensive work like video-editing or heavy gaming, and want a premium laptop with a battery that lasts you all day even while traveling, the Surface Book 2 can be a solid option. The original Surface Book was a novel idea that was in need of some polishing. With the Book 2, Microsoft simply refused to do that polishing, resulting in a great device that's still as great and as flawed as the original. The Microsoft Surface Book is ideal for those who are creative, want power in the laptop to do whatever they want to do and loves portability to take their work where they want to go. At Rs 1,85,999 the 13.5-inch Surface Book is pitted against the new MacBook Pro. The USP of the Surface Book is clearly as the personal computing device that offers the maximum input options. Overall, I have been impressed during my time with the Surface Book 2. While Ryan experienced things like Bluescreens associated with the detachable base setup, I've had no stability issues so far with the Surface Book 2. It feels like the Surface Book 2 is the realization of the concept that the original Surface Book was trying to convey, but without the associated rough edges. Move up to the $2,999 base Core i7, though, with its 8GB of RAM, 256GB of PCIe storage and GTX 1050 graphics and the Surface Book 2 makes a lot more sense. It remains a lot of money to pay for a laptop, no matter how multitalented, but if you can see yourself taking full advantage of everything it has to offer, the Microsoft Surface Book 2 is a truly brilliant machine. Reviewing the Microsoft Surface Book 2 is like putting on a pair of comfortable old slippers – that aaahhh feeling of familiarity and comfort as you slip into them. The Surface Book 2 is one of those devices that I just want to make my forever PC. It just feels really comfortable to use. The build quality is solid, the keyboard feels just right, and the form factor is really cool. Given its premium nature and unique design, it is not surprising the Surface Book 2 also carries a rather hefty price tag. In Malaysia, the base model with integrated already carries a price tag of RM 6,899 while models with dedicated NVIDIA GeForce GTX graphics starts from RM 8,899 and can go up to RM 14,199. As it stands though, divorced from its financial impact on the wallet, there's simply nothing else that can compete with the Surface Book 2 and it's easy to recommend if you are shopping at the premium end of the 2-in-1 hybrid laptop market. Surface Book 2 has raised the bar for versatile laptop design and sets a high standard for other PC manufacturers to aspire to. The Surface Book 2 is an excellent laptop than tries to do a bit too much for its own good. While it excels in a number of areas, it's forced to make a couple of disappointing compromises that stop it from achieving its full potential. Despite those shortcomings, Microsoft has again delivered one of the best 2-in-ls on the market for pro users — it’s a rarity to find a hybrid device that works equally well in both laptop and tablet modes, but the Surface Book 2 achieves it. The Surface Book 2 is a product for a very specific kind of person. The kind of person who digs the glamor of the Surface range but needs more grunt than is offered by the other options on the table. With its power, impressive battery life and sturdy yet elegant appearance, I have no qualms in giving the Surface Book 2 a hearty recommendation. In my opinion, this is the Windows laptop to beat. But just how many engineers and devs need a touchscreen, and a heavyweight lean-back tablet to take home and watch Netflix, I wondered? You tell me. 80% Surface Book 2: is this wonderful 13.5-inch laptop the best you can get? Overall, the Surface Book 2 13.5-inch is undoubtedly a premium product – nothing about it feels underdone and it’s the most powerful 2-in-1 laptop we’ve tried. As with the 15-inch version, it’s an excellent showcase for Windows 10, including the new features of the Fall Creators Update, such as Windows Mixed Reality, It has a premium design and excellent features though it comes at a price. But it’s not just about the components. Microsoft’s display is arguably the best in any notebook. The magnesium finish is fantastic. The design is interesting, and functional, and the versatility of the detachable display, even if only to flip it around to watch a movie on a plane, adds value to the device. When Surface Book launched in 2015, it was a new, fresh take. The 2017 model adds performance, refinement, and reliability, and is simply one of the best notebooks on the market today. If you can afford a Surface Book 2, we’d recommend it. So many of its attributes are simply fantastic, including its graphics performance and stellar battery life. If Microsoft had avoided all of the complications associated with its decision to incorporate USB-C (omitting Thunderbolt, upgrading the Dock), as well as the power issues, we’d be hard-pressed to find anything wrong with the Surface Book 2 at all. Microsoft has made its “ultimate laptop” even better, in many ways. Just not all of them. Microsoft's issued a statement that explained the laptops' power management smarts ensure their batteries will never become completely depleted, and also recommended users keep an eye on their power management settings. However reviewers have noted that some software demands the laptop runs at maximum settings. In the short time Microsoft has been creating its own devices, it has quickly become known for offering some of the best displays you can find on a laptop or tablet. And the Book 2 is no different in that regard. Whether you’re using the 13.5-inch model or the 15-inch, you’ll get a gorgeous PixelSense panel. In many areas that Microsoft Surface Book 2 is an unrivalled pro workhorse; a device more versatile than just being a laptop. It further cements Microsoft's position as a hardware manufacturer to be reckoned with and, we suspect, will go down a storm with many creatives as "the ultimate 2-in-1". A productivity powerhouse that’s flexible and portable, but the Surface Book 2 carries a hefty price premium. 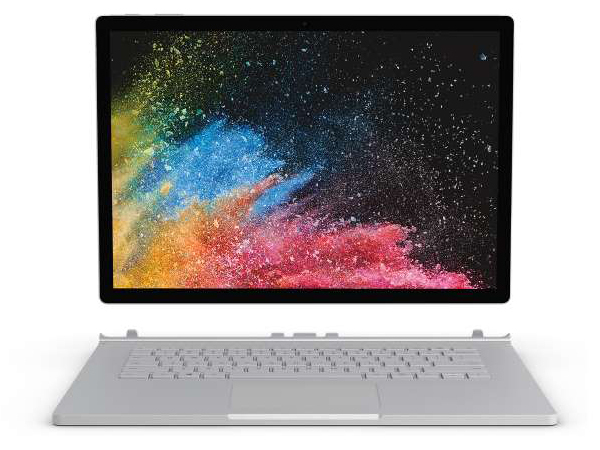 The Surface Book 2 is a feat of design, a top-of-the-line premium convertible 2-in-1 laptop that's fast, long lasting, versatile, and portable. It's even up for gaming. The bottom line? If you can afford a Surface Book 2, we’d recommend it. So many of its attributes are simply fantastic, including its graphics performance and stellar battery life. If Microsoft had avoided all of the complications associated with its decision to incorporate USB-C (omitting Thunderbolt, upgrading the Dock), we’d be hard-pressed to find anything wrong with the Surface Book 2 at all. Microsoft has made its “ultimate laptop” even better, in many ways. Just not all of them. If you’re a Windows fan, though, there are several very good reasons why the Surface Book 2 should be top of your list when it comes to upgrading your laptop. Only the absence of Thunderbolt 3, and the fact that you get a single USB-C port mar the experience. Otherwise, the Surface Book 2 wraps cutting-edge performance in a beautifully made package, and if that’s not giving Apple sleepless nights then they’re not paying enough attention. The Surface Book 2 looks to be a very accomplished laptop, taking the original and improving it. There's a lot to like here across all areas - unsurprising when we were very impressed with the first generation. The only real downside is the steep cost. Microsoft is on a roll with its hardware, and the Surface Book 2 looks set to continue that. There’s simply very little on the market that can come close to the mobility, power, and functionality that the Surface Book promises to provide. Surface Book 2 Hands-on: Is this Microsoft’s best laptop yet? The Surface Book 2 is the perfect tool to showcase Microsoft’s ever-improved Windows 10 ecosystem, and comes with all the bells and whistles you’d expect of a premium laptop. Surface Book 2 brings this wonderful hybrid up to date. It's designed to empower its users, to ensure that the hardware doesn’t present any limitations within Microsoft's vision of the future of mobile productivity. But that still comes at a price and great as it may turn out to be, cash is still king and you can get this power elsewhere for cheaper. What isn’t disappointing, though, is our first look at the Surface Book 2. And unlike years past, Microsoft is launching a major OS update, the Windows 10 Fall Creators Update, on top of this new hardware. That’s a one-two punch competitors like Apple and Google employ. Now Microsoft is taking that tactic and using it to its advantage. While Microsoft digs its feet in the sand on the Fulcrum hinge design and resultant 'gap', the Surface Book 2 is absolutely current with the most powerful Intel and Nvidia hardware, while getting thinner and lighter than ever. Plus, with a 15-inch model now in the cards, Apple's claim to creative pro supremacy (and otherwise) has been seriously challenged. The 15-inch version of the Microsoft Surface Book 2 is a 2-in-1 detachable tablet that caters to artists, gamers, and performance-craving users who value a large screen and powerful components. 85% Viel Bock aufs Book! 95% [Recenzja] Surface Book 2 – hybryda za ponad 10000 zł. Warta ceny? 82% Microsoft Surface Book 2 - sprzęt za 15000 złotych. Czy to się opłaca? Microsoft Surface Book 2: Unikalny i stylowy laptop biurowy, ale czy tylko to?